Sasaki Yoshimitsu (1850 - 1891) Two figures on a Stage, 1870's. Hand Painted Key Block Oban yoko-e. This is a very rare item indeed. This is a hand painted key block print probably used either to experiment with colours or to indicate the colours to be used by the artist to the printers. The production of prints involved a great deal of communication. The artist made the design, drawing onto paper with a brush. This design was copied onto very thin paper and then pasted to a block of wood which was carved and several black sheets were printed of the key block. These sheets were handed back to the artist who then painted the designs by hand in order to show the colours that he wanted to see on the final print. More often than not all of these preliminary drawings and paintings were destroyed in the process and were in any case not valued as they might be today. This is a lovely piece; the final print would likely have been a chuban diptych. The drawing here is onto a single sheet. The colours are rich and deftly applied and there are some intriguing details such as the black lacquer that has been applied to the collar of the right hand figure. There are metallic additions as well. 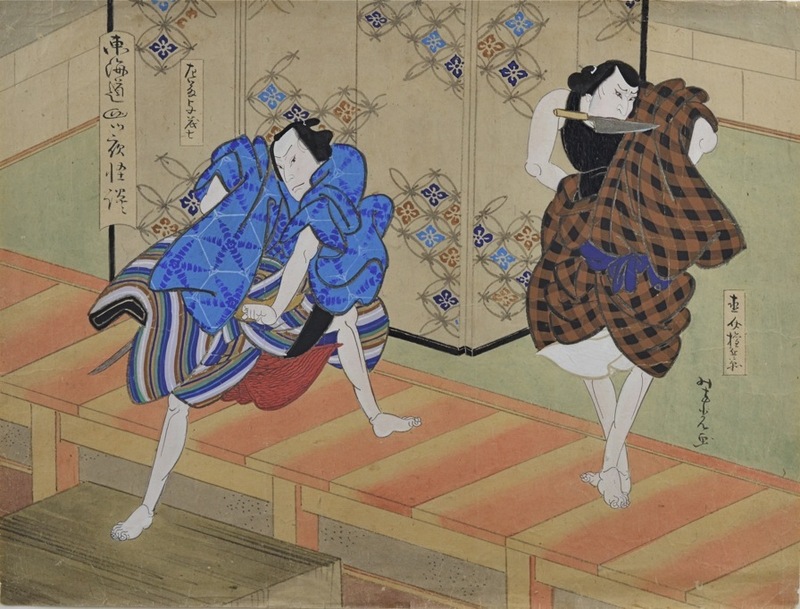 It is possible that this is a scene from the notorious ghost play, Tokaido Yotsuya Kaidan. This is a hugely complex drama; the bones of the story concern Iemon, who is married to Oiwa. He resolves to marry Oume but first must dispose of his wife. The family of Oume provide him with a disfiguring face cream that Oiwa applies and the result is one of the most dramatic scenes in kabuki theatre. Transformed with the mandatory face make up of a distorted and drooping eye, the actor starts to comb his hair leaving a mountain of fallen locks, revealing the final hideous transformation of the character. 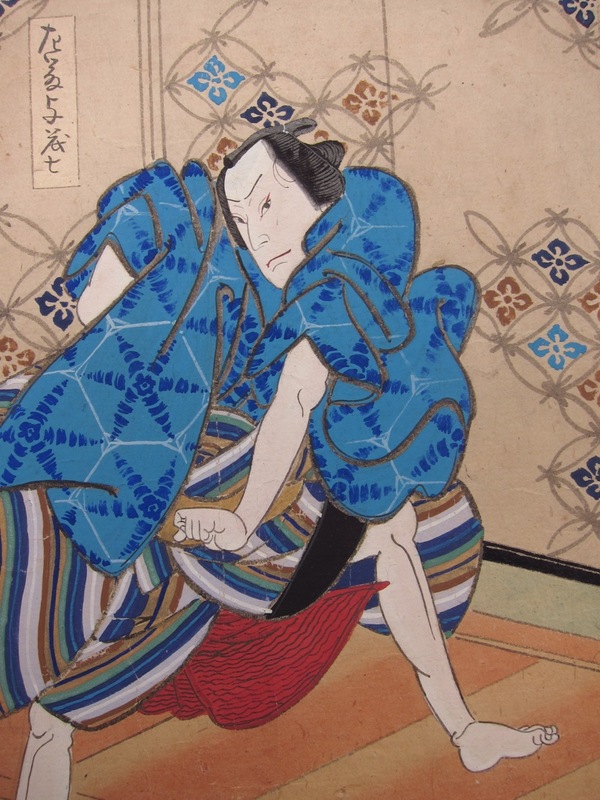 In the version illustrated here, Kobotoke Kohei, the former servant of Iemon, steals the traditional medicine of the Tamiya family from his master. Iemon catches Kohei and murders him. Then he orders his cronies to nail the bodies of Oiwa and Kohei to the opposite sides of a door and to throw the door into a river. The motive is to link Oiwa and Kohei as lovers. Famously, Oiwa returns to haunt Iemon in various guises - most well known in ukiyo-e as a broken lamp shade. She eventually drives him mad and he takes his life. The play has a political subtext and was widely seen as part of the growing disaffection with the traditional role of women in Edo society. 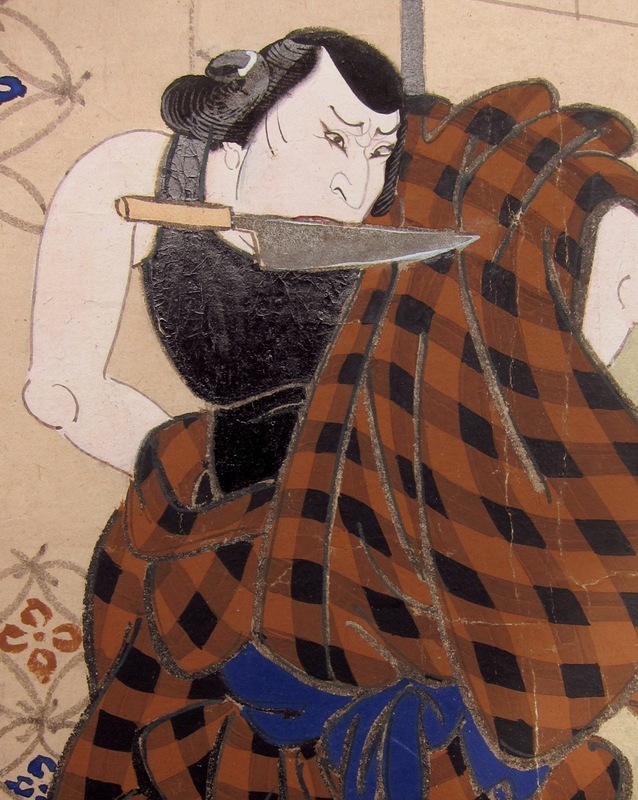 The dramatic revenge upon Iemon by his wife was an expression of the increasing intolerance that Edo women had with the outdated patriarchal society - out of step with the new bourgeois culture of the time. A 1956 film version of the play with subtitles is available on Youtube. A unique and lovely object, unbacked, colour and condition are very fine.